When you need to stock your shop with the best parts available, look no further than us. As a large OEM parts dealer, we have been in business since 1965—over 50 years! With more than 4 million OEM parts, you will be able to easily find everything you need to add to your shop's inventory. We carry parts for the following brands: Honda, Sea-Doo, Ski-Doo, Yamaha, Kawasaki, Can-Am, Suzuki, Indian, KTM, Polaris, and Arctic Cat. Alongside parts, we also include a vast assortment of accessories, apparel, riding gear, and aftermarket products. We are your new one-stop shop! We know that it can be difficult to find certain parts from specific brands, especially when you need them right away. When you sign up to be a dealer with us, you'll have access to our expansive inventory of OEM parts that will be shipped out to you in a week or less. In all, the average parts order takes 4 to 7 business days from the day you order online until the day you receive the parts at your door. There is NO buy-in or minimum order, meaning you can purchase as little or as much as you need. To set up your account, fill out our form, or call Jordan Willis at 269-385-1540 (Ext: 1342). You may also email at jordanwillis@zeigler.com with any questions. 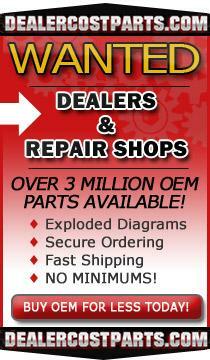 When you buy OEM, you're purchasing parts made by the manufacturer for a specific model. These ensure a perfect fit every time. We offer a wide range of parts for Arctic Cat, Can-Am, Honda (including engine, Marine, and Power Equipment), Indian Motorcycle, Kawasaki, KTM, Polaris, Sea-Doo, Ski-Doo, Suzuki, and Yamaha. From larger parts like engines and carburetors to smaller ones like fenders, brakes, and wiring, we have all the right parts you need to keep on hand in your shop. We also offer a large range of OEM accessories for the brands we carry. For Arctic Cat, Yamaha, Suzuki, Can-Am, Honda, Indian Motorcycle, Kawasaki, Polaris, Sea-Doo, and Ski-Doo, we offer all the best accessory options to have available to your customers. No matter what you need—audio, mirrors, lighting, trim, or windshields—we have it all. If a customer asks for it and you don't have it in stock, find it with us! If you stock apparel and riding gear in your shop, our large selection will allow you to introduce new items and keep your existing inventory fulfilled. We carry official apparel for Yamaha, Ski-Doo, Sea-Doo, Polaris, Kawasaki, Indian Motorcycle, Can-Am, and Arctic Cat. From men's and women's t-shirts and jackets to pants and hats, we have the apparel you need for your shop. Plus, we offer excellent officially licensed riding gear options, like gloves, helmets, goggles, back protectors, footwear, and various vehicle cleaning products. If you prefer carrying aftermarket products, we have thousands of great items to choose from. From casual apparel and riding gear to luggage, electrical goods, and vehicular accessories, we have everything you need to totally outfit your shop to be a serious competitor in your area! We even offer trailer and transport items, as well as in-shop displays to create a knockout storefront. New Dealers or Already Enrolled Dealers, Easy Signup! New dealers please put your email in below and then follow the instructions in the next window. Already a dealer please hit the Please Login Link.